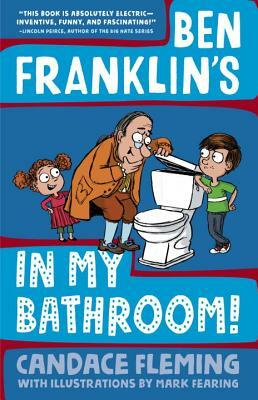 History meets hijinks in this first title in a hilarious new middle grade series for fans of Timmy Failure and The Terrible Two, when Ben Franklin accidentally time travels to a 10-year-old's home in 21st century America! Candace Fleming is the versatile, award-winning author of The Family Romanov, a Sibert Honor Book and the recipient of both the Boston Globe- Horn Book Award and the Los Angeles Times Book Award for Young Adult Literature; Amelia Lost, which received four starred reviews; The Great and Only Barnum, a YALSA Award for Excellence in Nonfiction nominee and a Publishers Weekly and Booklist Best Book; The Lincolns: A Scrapbook Look at Abraham and Mary, a Boston Globe- Horn Book Award recipient; Our Eleanor, an ALA Best Book for Young Adults; and Ben Franklin's Almanac, a James Madison Honor Book. She is also the author of many highly acclaimed picture books, including Oh, No!, illustrated by Eric Rohmann, and middle grade, including The Fabled Fourth Graders of Aesop Elementary School. Visit her on the web at candacefleming.com and on Twitter @candacemfleming. Mark Fearing has created award-winning editorial cartoons, animated shorts that have appeared on Nickelodeon and G4, and was a production manager for Walt Disney Television Animation. He is also the illustrator of Margaret McNamara's Three Little Aliens and the Big Bad Robot, published by Schwartz &Wade in 2011. Visit him on the web at markfearing.com and on Twitter @MarkFearing.